Black Dinah Chocolatiers closed its Blue Hill Tasting Room, located inside Fairwinds Florist on Main Street, Blue Hill, on February 28. 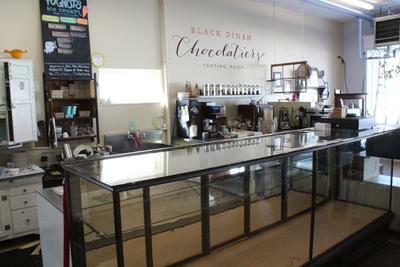 A popular spot for locals and visitors to downtown Blue Hill, Black Dinah Chocolatiers closed its tasting room with little notice Thursday, February 28. The business, located inside Fairwinds Florist, sold high-end chocolates and other sweets, along with coffee, espresso drinks and Pugnuts Ice cream. Fairwinds owner Cullen Schneider served as manager. Kate and Steve Shaffer, who launched Black Dinah’s on Isle au Haut in 2007 and opened the Blue Hill tasting room in 2012, moved their base to Westbrook in 2015. Shaffer said that chocolate sales “swing from holiday to holiday” and after Valentine’s day, she and Steve considered whether the business could sustain itself until Easter.